When I left my corporate job to be a studio artist a couple of years ago, I just threw a studio together. It was functional, but pretty ugly. And just kept getting uglier and uglier as I added plastic drawer things, boxes and general junk. My Xmas present to myself was new studio furniture. Between Ikea and a propitious trash find, I now have exactly what I need for an awesome studio. It took me a couple of days to put it together (it takes a while to translate those Swedish pictures), but the effort was well worth it! I left my studio layout the same, because it works well for me. 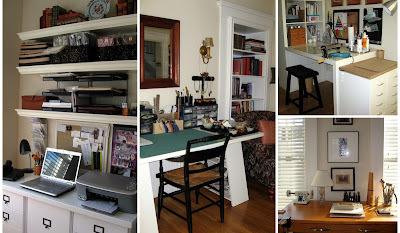 I have four stations: a polymer worktable, a metalwork area, a jewelry assembly and finish area and an office workspace. Oh, the joy of not having to clear my polymer table to set up my metal stuff! What about that lucky trash find? Well, it's my new metalsmithing table. I found it not more than 20 feet from my front door - it's a wood kitchen island that a neighbor left out with the trash. The funny thing is that I found it the day after I finished setting up my furniture. Karma. 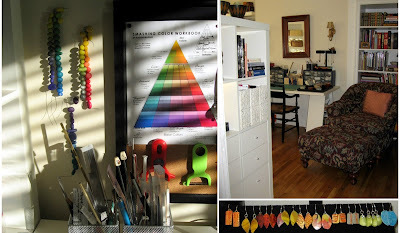 I took some close-ups, too - of my polymer tools, color chart and color scales, my comfy chair(a must in every studio!) and a bunch of my new Maya line of earrings ready to be packaged. Why am I making such a production about an attractive studio? First, because a nice environment makes my work better. And second, because I live in a 1865 Boston rowhouse and my studio is connected to my living room! How fantastic, Betsy! I have dreams of doing the same thing someday. My studio is our sunroom off the living room and the plastic drawers are a bit of an eye sore :) Great job! OHH love it!!! I'm going to clean my studio now. You must love to go to work now! looks amazing! wish i could keep my studios that neat! What a great job you did with your studio Betsy! Very inspiring to me!